Acid stained concrete gives your concrete floors a unique antiqued look. It can be applied indoors or outdoors and is sure to change the look of any area. 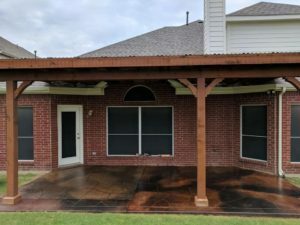 It can be applied to existing concrete, new concrete or overlay concrete. A good color selection to choose from, you can even apply them together for a really colorful concrete floor. Finish off any acid stain project with a glossy sealer or high gloss urethane coating for a truly eye popping floor. 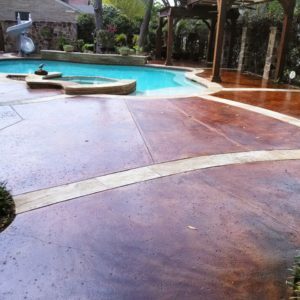 Acid stain will make any area pop with elegance. Looks better when combined with a gloss finish sealer. Want us to layer the stain to see what happens? Sure why not, throw in some custom scoring and lets see what comes out of it.